This is my third year writing about the Toronto International Film Festival with film editor A.A. Dowd (our dispatches will run on alternating days), and right now everything feels out-of-whack: On the flight, where I sit behind a snoring guy with a Viking topknot and steroid acne and across from a fiftysomething woman who holds a sheet of dried seaweed (A1 paper size) like a giant chocolate bar, chewing loudly as she underlines passages in a book about how the government doesn’t want us to know that cannabis is the cure for cancer; at passport control, where the Canadian border agent only wants to question me about Hell Or High Water; on the street outside the TIFF Bell Lightbox complex, where a burst of wind knocks over restaurant tables and a block-long pedestrian barricade. All film festival trips devolve into parodies of film festivals well before the final gala event (a fact that Cannes has perfected into an art form), but rarely this fast. Already on the first day, I find myself watching a hypnoid allegory for the death of cinema in a theater that is being rapidly emptied by walkouts. Albert Serra’s The Death Of Louis XIV (Grade: C+) riffs on the body politic by casting New Wave totem and onetime François Truffaut alter-ego Jean-Pierre Léaud as the elderly, bedridden Sun King, who is dying of gangrene as the best medical minds of his day sniff his feet and prescribe donkey’s milk. Serra, a fortysomething Catalan filmmaker who looks like he used to be in The Hives, takes canonical sources (Don Quixote, the gospels, Casanova) and rigorously drains them of eventfulness, peddling the result as essence de longueur. Things To Come (Grade: B) has its own moment of cheeky reference involving iconic French actors, sending off the protagonist played by Isabelle Huppert to see a Juliette Binoche movie. (It’s Certified Copy, no less.) But in keeping with writer-director Mia Hansen-Løve’s overall ethos, even that star-vs.-star in-joke perfectly fits the character. Having made dramas that were set in the small worlds of arthouse film financing (Father Of My Children) and French house music (Eden), she shifts her attention here to a year or so in the life of a philosophy teacher named Nathalie (Huppert) as so many of the things that she’s taken for granted crumble away. The narrative is all incident and it benefits from Hansen-Løve’s arresting and lifelike succinctness, which conveys in single sentences what less gifted filmmakers might devote a monologue to, and makes moments and gestures even more touching by tossing them off casually or making an unexpected cut. Nonetheless, this strikes me as one of her lesser efforts, despite having so many beautiful moments. (A favorite: Nathalie crying on a tram, and then bursting into laughter after she sees her ex-husband on the street with his new girlfriend, with the whole scene refracted through the point-of-view of another passenger.) Hansen-Løve’s major theme is how we define and change our lives while barely noticing it. But while the intentional lack of forward momentum here produces some unexpected tangents—say, Nathalie going off to stay in a former student’s anarchist commune, bringing along her mother’s obese cat in a carrier—it feels like a step back after the decades-spanning Eden. Of course, I now realize that I thought Eden was a tad underwhelming when I first saw it. Maybe the grade will go up; these movies grow on you. The starry, red-carpet opening night premiere slot isn’t known for quality. 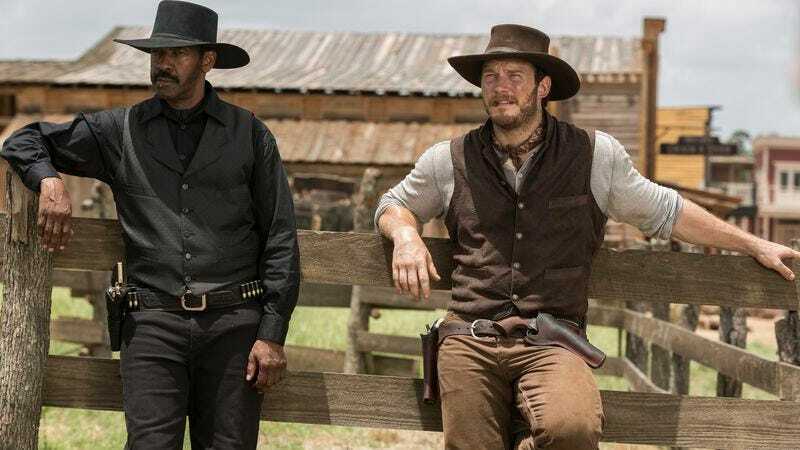 This time around, it’s Antoine Fuqua’s remake of The Magnificent Seven (Grade: C), which updates the 1960 John Sturges Western (itself a remake of The Seven Samurai) for the mid-1990s by substituting hired henchmen for bandits, James Horner for Elmer Bernstein, and Denzel Washington, Ethan Hawke, and Chris Pratt’s impression of Harrison Ford for the original’s ensemble of tough-guy actors. Fuqua is a prototypical journeyman who never rises above a script, and the one he’s working with here (courtesy of Richard Wenk and True Detective creator Nic Pizzolatto) consists of about a half-dozen choice zingers and a whole lot of bull. Everybody has a dirty face, a drinking problem, and a “shoot first” outlook, none of which really covers up the fact that this movie is even more morally superficial than Sturges’ version. There’s no moment of moral choice here: The leader of the seven (Denzel Washington) is now a U.S. Marshal with a score to settle with the villain (Peter Sarsgaard), the sort of robber baron who walks into a room with a prepared monologue about capitalism, complete with visual aid. The rest of the marshal’s band of hired guns have almost no motivation; one of them—a Comanche named Red Harvest, after the Dashiell Hammett novel that inspired Yojimbo—just kind of materializes out of the limbo space where Magical Indians are kept when not needed. Fuqua studiously replicates the 35mm Panavision look of the PG-13 action-adventure flicks of yesteryear, though that doesn’t help clarify the climactic siege. Plus: The teenage outcast son of a rural fire chief starts fires to spend more time with dad (or something) in Pyromaniac (Grade: C+). As a psychological study of a dead-eyed fire starter with a Hitler Youth haircut, this is largely insipid, but as a depiction of a unique milieu—specifically, volunteer fire departments in small-town Norway in the late 1970s, with an emphasis on equipment maintenance, procedure, and social status—it’s often compelling.